I have a photo to go with this blog and i will put it up one day. 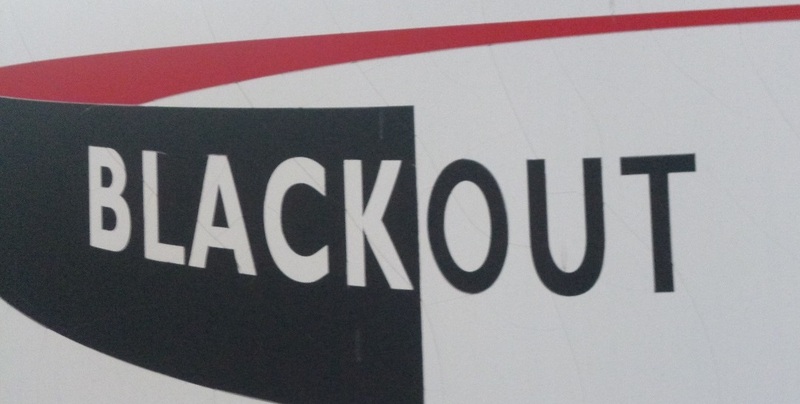 Its simply a sign reading Black Out. It promotes a drapery company, specialising in what must be very effective blinds. I took it one day when walking away from a public meeting. I understand how close it is to reading blacks out and as uncomfortable as that reading is it seems to sum up much of the tone of the meeting. And yet... this was a public meeting about public transport and in particular buses. The room seemed to be pretty much divided 50/50. The right side, the left side and the wrong side the right side. The right side full of hate. The right side wants public transport to be good for them but the right side also knew who they don't want included in the public. The rights were saying if public transport is to be public then it should be for us... it shouldn't be for kids, kids make noise, kids can walk, it's good for them. We don't want hungry people on our buses. Eaters should be banned. I dare say especially useless eaters and I must say there is a side of me that sides with this. Fast foods smell and I don't eat meat so I don't want to smell it. I think there is something to be said for manners and etiquette but I don't want to ban eaters per se from buses. And then there was this view bravely expressed in a public meeting about public transport... 'keep the loonies off the bus, you don't know what they carry with them... I mean they might have knives'. I wonder how much of this had been propagated by the genial host who had told us that her assistant lived on a bus route but should really be living in another instutition. Titter ye not I thought but many did. And yet... there was another side, a side that didn't think public transport shouldn't be public. A side that thought, well, yes, actually I'd like to be a part of the public. I'd like to be included. I insist that my needs are met and that public utilities should exist along the routes that public transport takes. This side talked about an integrated, accessible public transport system that included everyone, that addressed issues around community, comfort, safety, education and health. Access raised its head and someone unfurled an old banner reading Rights Now. All in all, as you can tell from the size of the last two paragraphs, the left side, the right side, spoke less. It was quieter, more subdued, almost exhausted by the repitition of its claims. Hate spits venom and leaves a mark. Love does something else entirely. And I walk past a sign and photograph it, wondering about a split within the nation. A 50/50 split. We have been extremely quiet about welfare reform. Stats say 50% of the country support the government. Deprivation is a good thing. Poverty is to be applauded if it comes from a cuts package that excludes those scroungers and when looked at in those terms poverty doesn't even exist, does it? It's just bad people making bad choices. DPAC aside, the silence that meets this view is deafening. And I am recalling this meeting, in front of social workers, on the day it is announced the government will go ahead with cutting the ILF after all, on the day that a friend posts on facebook that Brent council will make another £4 million cut to social services, during the week when another council says we have cut all the management we can so we will go for front line workers next, the support workers, the PA's, the housing benefits office worker. I walk along and further down the road, there is another sign and the sign reads Sky Line. I'm not sure who it's for but i look beyond it. The clouds are still there but it's clearing and another side kicks my depression with hate aside and I feel hopeful. I hope the good side of the 50/50 gets louder. I see signs that a turn around is coming and my views will be more clearly heard and better articulated. I arrive home. Life is good already.